61. The Agenda’s Goals and targets deal with the means required to realise our collective ambitions. The means of implementation targets under each SDG and Goal 17, which are referred to above, are key to realising our Agenda and are of equal importance with the other Goals and targets. We shall accord them equal priority in our implementation efforts and in the global indicator framework for monitoring our progress. 62. 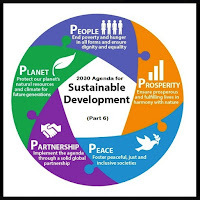 This Agenda, including the SDGs, can be met within the framework of a revitalized global partnership for sustainable development, supported by the concrete policies and actions outlined in the Addis Ababa Action Agenda , which is an integral part of the 2030 Agenda for sustainable development. The Addis Ababa Action Agenda supports, complements and helps contextualize the 2030 Agenda’s means of implementation targets. These relate to domestic public resources, domestic and international private business and finance, international development cooperation, international trade as an engine for development, debt and debt sustainability, addressing systemic issues and science, technology, innovation and capacity-building, and data, monitoring and follow-up. 63. Cohesive nationally owned sustainable development strategies, supported by integrated national financing frameworks, will be at the heart of our efforts. We reiterate that each country has primary responsibility for its own economic and social development and that the role of national policies and development strategies cannot be overemphasized. We will respect each country’s policy space and leadership to implement policies for poverty eradication and sustainable development, while remaining consistent with relevant international rules and commitments. At the same time, national development efforts need to be supported by an enabling international economic environment, including coherent and mutually supporting world trade, monetary and financial systems, and strengthened and enhanced global economic governance. Processes to develop and facilitate the availability of appropriate knowledge and technologies globally, as well as capacity-building, are also critical. We commit to pursuing policy coherence and an enabling environment for sustainable development at all levels and by all actors, and to reinvigorating the global partnership for sustainable development. 64. We support the implementation of relevant strategies and programmes of action, including the Istanbul Declaration and Programme of Action, the SIDS Accelerated Modalities of Action (SAMOA) Pathway, the Vienna Programme of Action for Landlocked Developing Countries for the Decade 2014-2024, and reaffirm the importance of supporting the African Union’s Agenda 2063 and the programme of the New Partnership for Africa’s Development (NEPAD), all of which are integral to the new Agenda. We recognize the major challenge to the achievement of durable peace and sustainable development in countries in conflict and post-conflict situations. 65. We recognize that middle-income countries still face significant challenges to achieve sustainable development. In order to ensure that achievements made to date are sustained, efforts to address ongoing challenges should be strengthened through the exchange of experiences, improved coordination, and better and focused support of the United Nations Development System, the international financial institutions, regional organizations and other stakeholders. 66. We underscore that, for all countries, public policies and the mobilization and effective use of domestic resources, underscored by the principle of national ownership, are central to our common pursuit of sustainable development, including achieving the sustainable development goals. We recognize that domestic resources are first and foremost generated by economic growth, supported by an enabling environment at all levels. 67. Private business activity, investment and innovation are major drivers of productivity, inclusive economic growth and job creation. We acknowledge the diversity of the private sector, ranging from micro-enterprises to cooperatives to multinationals. We call on all businesses to apply their creativity and innovation to solving sustainable development challenges. We will foster a dynamic and well-functioning business sector, while protecting labour rights and environmental and health standards in accordance with relevant international standards and agreements and other on-going initiatives in this regard, such as the Guiding Principles on Business and Human Rights and the labour standards of ILO, the Convention on the Rights of the Child and key multilateral environmental agreements, for parties to those agreements. 68. International trade is an engine for inclusive economic growth and poverty reduction, and contributes to the promotion of sustainable development. We will continue to promote a universal, rules-based, open, transparent, predictable, inclusive, non-discriminatory and equitable multilateral trading system under the World Trade Organization (WTO), as well as meaningful trade liberalization. We call on all WTO members to redouble their efforts to promptly conclude the negotiations on the Doha Development Agenda. We attach great importance to providing trade-related capacity-building for developing countries, including African countries, least-developed countries, landlocked developing countries, small island developing states and middle-income countries, including for the promotion of regional economic integration and interconnectivity. 69. We recognize the need to assist developing countries in attaining long-term debt sustainability through coordinated policies aimed at fostering debt financing, debt relief, debt restructuring and sound debt management, as appropriate. Many countries remain vulnerable to debt crises and some are in the midst of crises, including a number of least developed countries, small-island developing States and some developed countries. We reiterate that debtors and creditors must work together to prevent and resolve unsustainable debt situations. Maintaining sustainable debt levels is the responsibility of the borrowing countries; however we acknowledge that lenders also have a responsibility to lend in a way that does not undermine a country’s debt sustainability. We will support the maintenance of debt sustainability of those countries that have received debt relief and achieved sustainable debt levels. 70. We hereby launch a Technology Facilitation Mechanism which was established by the Addis Ababa Action Agenda in order to support the sustainable development goals. The Technology Facilitation Mechanism will be based on a multi-stakeholder collaboration between Member States, civil society, private sector, scientific community, United Nations entities and other stakeholders and will be composed of: a United Nations Interagency Task Team on Science, Technology and Innovation for the SDGs, a collaborative Multistakeholder Forum on Science, Technology and Innovation for the SDGs and an on-line platform. • The United Nations Interagency Task Team on Science, Technology and Innovation for the SDGs will promote coordination, coherence, and cooperation within the UN System on STI related matters, enhancing synergy and efficiency, in particular to enhance capacity-building initiatives. The Task Team will draw on existing resources and will work with 10 representatives from the civil society, private sector, the scientific community, to prepare the meetings of the Multistakeholder Forum on Science, Technology and Innovation for the SDGs, as well as in the development and operationalization of the on-line platform, including preparing proposals for the modalities for the Forum and the on-line platform. The 10 representatives will be appointed by the Secretary General, for periods of two years. The Task Team will be open to the participation of all UN agencies, funds and programmes, and ECOSOC functional commissions and it will initially be composed by the entities that currently integrate the informal working group on technology facilitation, namely: UN Department of Economic and Social Affairs, United Nations Environment Programme, UNIDO, United Nations Educational Scientific and Cultural Organization, UNCTAD, International Telecommunication Union, WIPO and the World Bank. 71. We reiterate that this Agenda and the Sustainable Development Goals and targets, including the means of implementation are universal, indivisible and interlinked. 72. We commit to engage in systematic follow-up and review of implementation of this Agenda over the next fifteen years. A robust, voluntary, effective, participatory, transparent and integrated follow-up and review framework will make a vital contribution to implementation and will help countries to maximize and track progress in implementing this Agenda in order to ensure that no one is left behind. 73. Operating at the national, regional and global levels, it will promote accountability to our citizens, support effective international cooperation in achieving this Agenda and foster exchanges of best practices and mutual learning. It will mobilize support to overcome shared challenges and identify new and emerging issues. As this is a universal Agenda, mutual trust and understanding among all nations will be important. a. They will be voluntary and country-led, will take into account different national realities, capacities and levels of development and will respect policy space and priorities. As national ownership is key to achieving sustainable development, the outcome from national level processes will be the foundation for reviews at regional and global levels, given that the global review will be primarily based on national official data sources. 75. The Goals and targets will be followed-up and reviewed using a set of global indicators. These will be complemented by indicators at the regional and national levels which will be developed by member states, in addition to the outcomes of work undertaken for the development of the baselines for those targets where national and global baseline data does not yet exist. The global indicator framework, to be developed by the Inter Agency and Expert Group on SDG Indicators, will be agreed by the UN Statistical Commission by March 2016 and adopted thereafter by the Economic and Social Council and the General Assembly, in line with existing mandates. This framework will be simple yet robust, address all SDGs and targets including for means of implementation, and preserve the political balance, integration and ambition contained therein. 76. We will support developing countries, particularly African countries, LDCs, SIDS and LLDCs, in strengthening the capacity of national statistical offices and data systems to ensure access to high-quality, timely, reliable and disaggregated data. We will promote transparent and accountable scaling-up of appropriate public-private cooperation to exploit the contribution to be made by a wide range of data, including earth observation and geo-spatial information, while ensuring national ownership in supporting and tracking progress. 77. We commit to fully engage in conducting regular and inclusive reviews of progress at sub-national, national, regional and global levels. We will draw as far as possible on the existing network of follow-up and review institutions and mechanisms. National reports will allow assessments of progress and identify challenges at the regional and global level. Along with regional dialogues and global reviews, they will inform recommendations for follow-up at various levels. 78. We encourage all member states to develop as soon as practicable ambitious national responses to the overall implementation of this Agenda. These can support the transition to the SDGs and build on existing planning instruments, such as national development and sustainable development strategies, as appropriate. 79. We also encourage member states to conduct regular and inclusive reviews of progress at the national and sub-national levels which are country-led and country-driven. Such reviews should draw on contributions from indigenous peoples, civil society, the private sector and other stakeholders, in line with national circumstances, policies and priorities. National parliaments as well as other institutions can also support these processes. 80. Follow-up and review at the regional and sub-regional levels can, as appropriate, provide useful opportunities for peer learning, including through voluntary reviews, sharing of best practices and discussion on shared targets. We welcome in this respect the cooperation of regional and sub-regional commissions and organizations. Inclusive regional processes will draw on national-level reviews and contribute to follow-up and review at the global level, including at the High Level Political Forum on sustainable development (HLPF). 81. Recognizing the importance of building on existing follow-up and review mechanisms at the regional level and allowing adequate policy space, we encourage all member states to identify the most suitable regional forum in which to engage. UN regional commissions are encouraged to continue supporting member states in this regard. 82. The HLPF will have a central role in overseeing a network of follow-up and review processes at the global level, working coherently with the General Assembly, ECOSOC and other relevant organs and forums, in accordance with existing mandates. It will facilitate sharing of experiences, including successes, challenges and lessons learned, and provide political leadership, guidance and recommendations for follow-up. It will promote system-wide coherence and coordination of sustainable development policies. It should ensure that the Agenda remains relevant and ambitious and should focus on the assessment of progress, achievements and challenges faced by developed and developing countries as well as new and emerging issues. Effective linkages will be made with the follow-up and review arrangements of all relevant UN Conferences and processes, including on LDCs, SIDS and LLDCs. 83. Follow-up and review at the HLPF will be informed by an annual SDG Progress Report to be prepared by the Secretary General in cooperation with the UN System, based on the global indicator framework and data produced by national statistical systems and information collected at the regional level. The HLPF will also be informed by the Global Sustainable Development Report, which shall strengthen the science-policy interface and could provide a strong evidence-based instrument to support policy-makers in promoting poverty eradication and sustainable development. We invite the President of ECOSOC to conduct a process of consultations on the scope, methodology and frequency of the Report as well as its relation to the SDG Progress Report, the outcome of which should be reflected in the Ministerial Declaration of the HLPF session in 2016. 84. The HLPF, under the auspices of ECOSOC, shall carry out regular reviews, in line with Resolution 67/290. Reviews will be voluntary, while encouraging reporting, and include developed and developing countries as well as relevant UN entities and other stakeholders, including civil society and the private sector. They shall be state-led, involving ministerial and other relevant high-level participants. They shall provide a platform for partnerships, including through the participation of major groups and other relevant stakeholders. 85. Thematic reviews of progress on the Sustainable Development Goals, including cross-cutting issues, will also take place at the HLPF. These will be supported by reviews by the ECOSOC functional commissions and other inter-governmental bodies and forums which should reflect the integrated nature of the goals as well as the interlinkages between them. 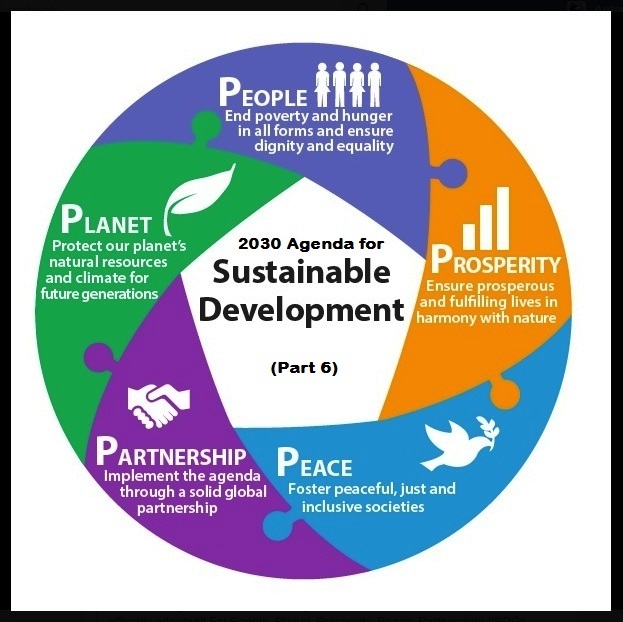 They will engage all relevant stakeholders and, where possible, feed into, and be aligned with, the cycle of the HLPF. 86. We welcome, as outlined in the Addis Ababa Action Agenda, the dedicated follow-up and review for the Financing for Development outcomes as well as all the means of implementation of the SDGs which is integrated with the follow-up and review framework of this Agenda. The intergovernmentally agreed conclusions and recommendations of the annual ECOSOC Forum on Financing for Development will be fed into the overall follow-up and review of the implementation of this Agenda in the HLPF. 87. Meeting every four years under the auspices of the General Assembly, the HLPF will provide high-level political guidance on the Agenda and its implementation, identify progress and emerging challenges and mobilize further actions to accelerate implementation. The next HLPF, under the auspices of the General Assembly, will take place in 2019, with the cycle of meetings thus reset, in order to maximize coherence with the Quadrennial Comprehensive Policy Review process. 88. We also stress the importance of system-wide strategic planning, implementation and reporting in order to ensure coherent and integrated support to implementation of the new Agenda by the UN development system. The relevant governing bodies should take action to review such support to implementation and to report on progress and obstacles. We welcome the ongoing ECOSOC Dialogues on the longer term positioning of the UN development system and look forward to taking action on these issues, as appropriate. 89. The HLPF will support participation in follow-up and review processes by the major groups and other relevant stakeholders in line with Resolution 67/290. We call on these actors to report on their contribution to the implementation of the Agenda. 90. We request the Secretary General, in consultation with Member States, to prepare a report, for consideration at the 70th session of the General Assembly in preparation for the 2016 meeting of the HLPF, which outlines critical milestones towards coherent efficient, and inclusive follow-up and review at the global level. This report should include a proposal on the organizational arrangements for state-led reviews at the HLPF under the auspices of ECOSOC, including recommendations on a voluntary common reporting guidelines. It should clarify institutional responsibilities and provide guidance on annual themes, on a sequence of thematic reviews, and on options for periodic reviews for the HLPF. 91. We reaffirm our unwavering commitment to achieving this Agenda and utilizing it to the full to transform our world for the better by 2030.